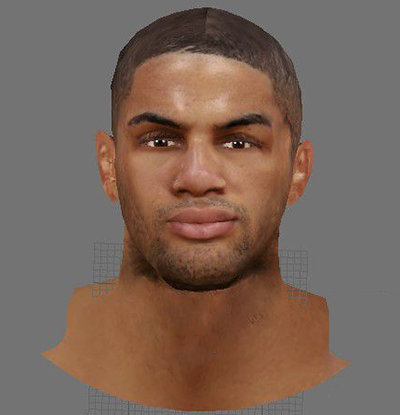 NBA 2K14 cyber face mod for Nicolas Batum of the Portland Trail Blazers. Thanks to DavidBeckham23 for sharing the next-gen reference pic. 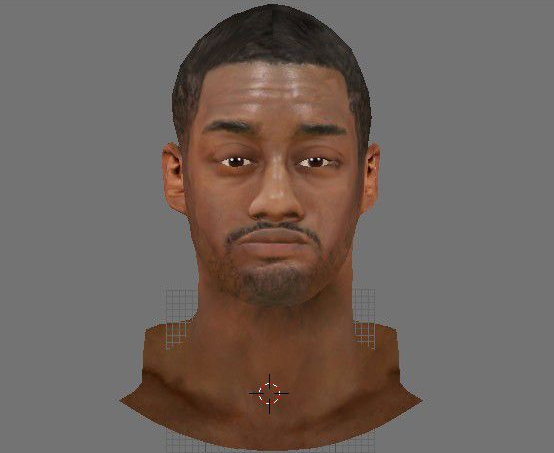 NBA 2K14 cyber face mod for John Wall of the Washington Wizards. The texture is based on the next-gen version of the game. Thanks to DavidBeckham23 for sharing the next-gen reference pics. This NBA 2K14 mod replaces the Houston 2013 Toyota Center All-Star court with New Orleans 2014 All-Star game court/arena. The patch includes an updated stadium and floor. 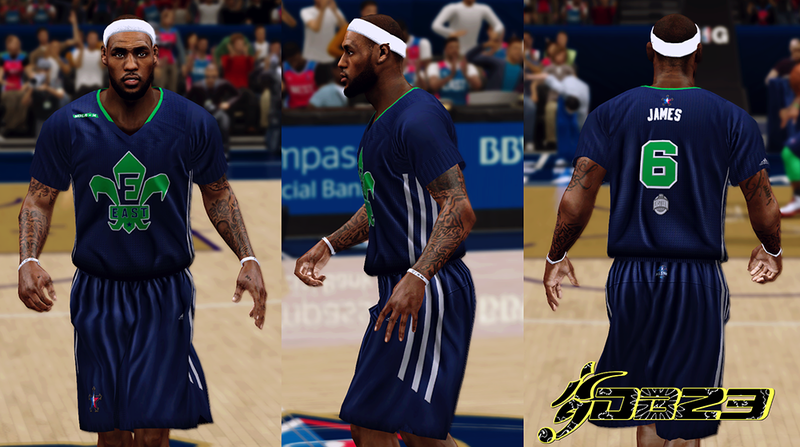 This NBA 2K14 patch replaces the old East All-Star jerseys (Houston 2013) in the game with 2014 East All-Star jerseys (NOLA 2014) which feature sleeves. The color and the design of the Away jersey is based on the official eastern conference uniform that will be worn during the All-Star Game, hosted by the New Orleans Pelicans on February 16, 2014. Fictional white jersey was added to fill in the Home slot. 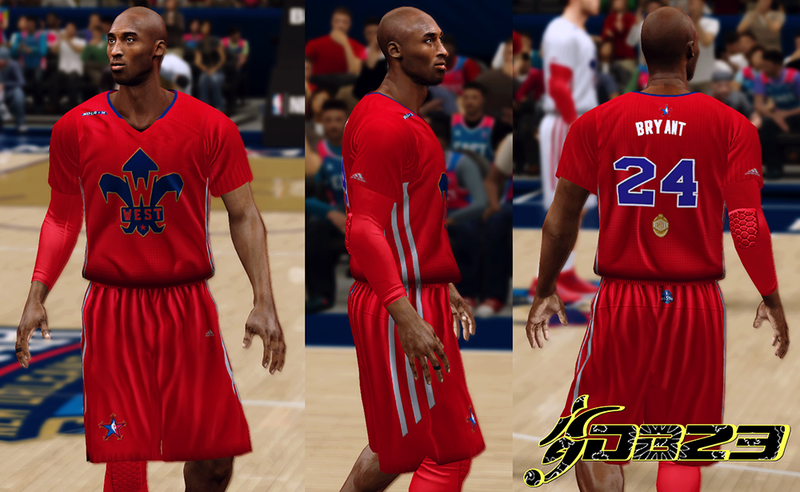 This NBA 2K14 patch updates the old West All-Star jerseys (Houston 2013) in the game with 2014 West All-Star jerseys (NOLA 2014) which feature sleeves. The color and the design of the Away jersey is based on the official western conference uniform that will be worn during the All-Star Game, hosted by the New Orleans Pelicans on February 16, 2014. Fictional white jersey was added to fill in the Home slot. 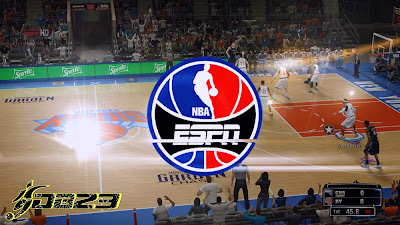 This NBA 2K14 patch adds the ESPN HD watermark logo on the top corner of the game screen. It also includes a ESPN wipe transition, which substitute for the "2K Sports" logo overlay. 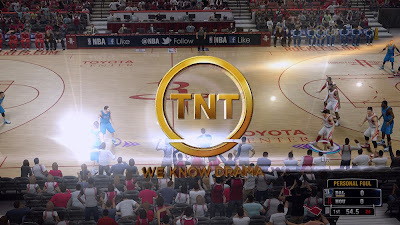 Description: TNT HD watermark logo and wipe transition screen with TNT's tagline, "We Know Drama" for NBA 2K14. - If you want the watermark to appear on upper-left side, click HERE (V1). 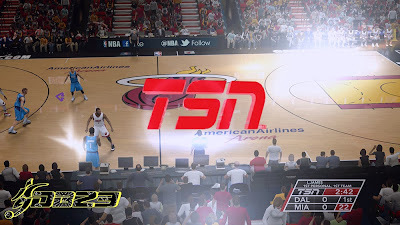 Description: This NBA 2K14 patch adds the TNT HD logo on the upper-left corner of the game screen. 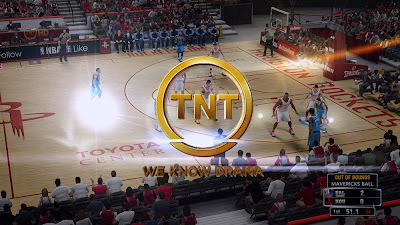 It also includes a TNT wipe transition with "We Know Drama" slogan, which replaces the 2K Sports overlay. - If you want the watermark to appear on the upper-right side, click HERE (V2). 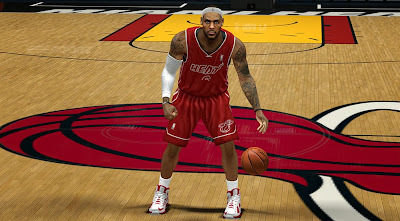 Description: This patch for NBA 2K14 adds the recently revealed red alternate uniform of the Miami Heat for the 2013–14 NBA season. It looks similar to the X-mas jersey that the Heat wore last season. 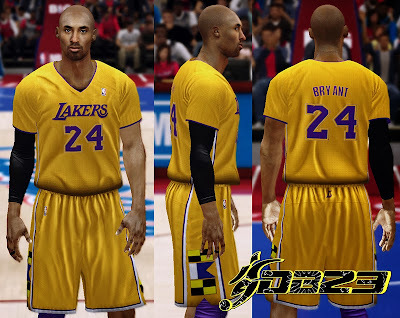 Description: This NBA 2K14 patch adds a yellow short-sleeved jersey to the Los Angeles Lakers. This is part of my "30 Teams Sleeved Jersey Project". 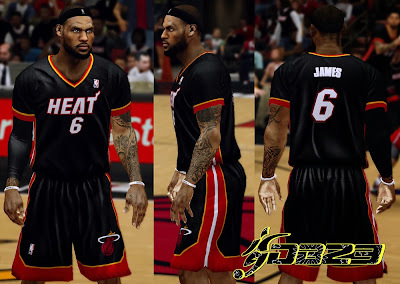 Description: This NBA 2K14 patch adds a black short-sleeved jersey to the Miami Heat. This is part of my "30 Teams Sleeved Jersey Project", so expect more to come. 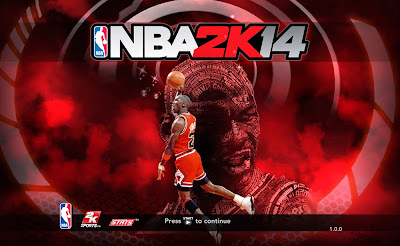 Description: This patch adds a custom NBA 2K14 start-up screen featuring the Greatest NBA player of All Time - Michael Jordan. 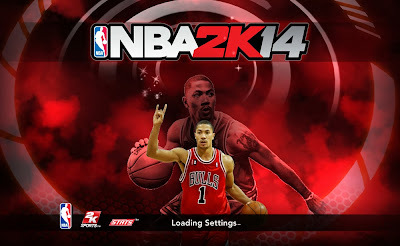 Description: Here's a custom game screen cover ft. Derrick Rose of the Chicago Bulls. It'll replace the default NBA 2K14 loading screen (LeBron James) so don't forget to create a backup just in case you want to revert it back. Description: Don't like LeBron James as the startup screen cover? No problem! 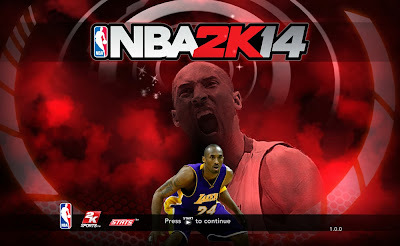 This NBA 2K14 patch will replace the default splash screen with a custom one, featuring Kobe Bryant. Description: This NBA 2K14 patch removes the player indicator (red circle icon on 'Instant Replay') beneath the player, ideal for those people who love taking screenshots. 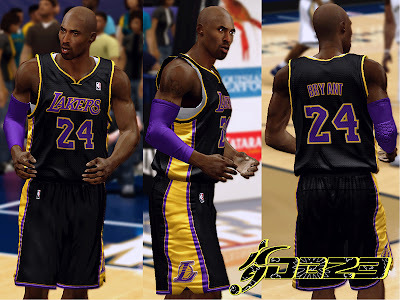 Description: This patch for NBA 2K13 contains 3 versions of the new black alternate jersey of the LA Lakers called "Hollywood Nights". The only difference between the three uniforms are the outline colors. Choose what suits your taste best. 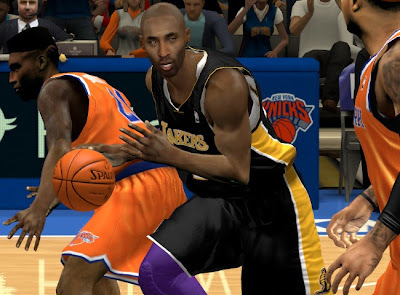 Description: This patch for NBA 2K13 adds the official Los Angeles Lakers 2014 black ‘Hollywood Nights’ alternate uniform (Black / Yellow). It will replace the old white Latin Nights jersey in the game. Features: Real jersey design and colors based on the teaser video . 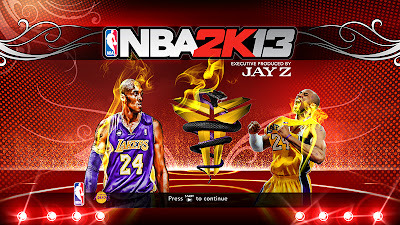 Description: Alternate title screen for NBA 2K13 featuring “The Black Mamba” Kobe Bryant with 3D graphic logo at the center. The patch includes 2 versions: 1 with 2K13 logo & 1 with 2K14 logo. Use/install what you prefer. Installation: Extract the titlepage file into NBA 2K13 main directory (Computer » Program Files » 2K Sports » NBA 2K13) and replace the original one. 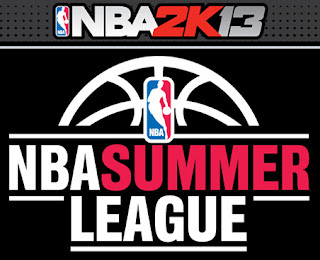 Description: This mod allows you to play 2013 NBA Summer League in NBA 2K13 PC. - 2013 NBA Summer League court & stadium. - All latest team transactions, draftees, trades, free agents, and rookies. - Thomas & Mack Center - UNLV court are set to every team as default.